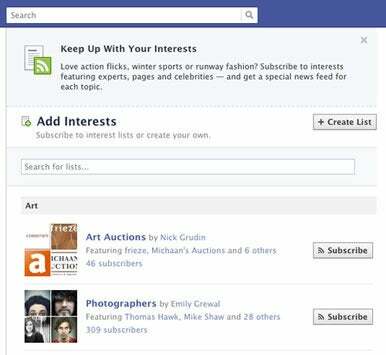 A few months ago Facebook rolled out a new feature called Interest Lists. On top of enabling users to follow specific topics on Facebook, Interest Lists also provide you with a means of promoting yourself and driving traffic to your own Facebook page or profile. The basic concept of the Interest List is similar to creating lists in Twitter, or Circles in Google+. You can organize related profiles and pages together in an Interest List. Sure, you can also simply friend, or subscribe to each of the pages and profiles from the list individually, but the Interest List has two advantages over that system. If you build a worthy Interest List, Facebook users will flock to it. First, Interest Lists make it easier to follow topic-specific content without cluttering up your main Facebook newsfeed. The top posts from your Interest Lists will appear in your feed, but most will not. You can view the complete catalog of posts by selecting a specific list from the Interests section in the left pane of the Facebook home page. Second, it makes it easier to follow content related to topic you’re interested in, or to promote and share those topics with others. You don’t have to scour all of Facebook to find the pages and profiles related to your favorite sport or hobby if someone else has already invested the effort to create an Interest List for the topic. Similarly, you can take the initiative to create your own lists for the topics that interest you, and share those with your Facebook friends or the public at large so they can follow all that same content with a single click. That brings us to the part where you come in. If you have a Facebook Page for your business, or a Facebook Profile that you want to build a following for, Interest Lists can be a great tool to accomplish that goal. Let’s say you’re in the business of making fitness equipment and apparel. You’d like to have a massive following and build a huge community around your Facebook Page, but the problem is attracting people to “Like” your page. You can spend money marketing and promoting your page on Facebook, or you can drive traffic using Interest Lists. How do you drive traffic with an Interest List? Well, you have to create an Interest List that others will find valuable…or interesting. For the purposes of our example, you would invest the effort searching Facebook to find great sources of fitness equipment and apparel related content and information, and create an Interest List for the topic. Of course, you also want to include your own Facebook Page or profile on that Interest List. If you curate the content to ensure the pages and profiles included in your Interest List provide value for people, and not just a bunch of noise and clutter to sort through, the Interest List will be popular with the target audience, and more people will subscribe to it. The more people subscribe to the list, the more people will also be subscribing to or following your own content as well. I can’t stress enough, though, that this isn’t a cheat or shortcut to delivering quality content. You might lure some people by just creating a list that appears to be about a given topic, but if the list is not comprised of worthwhile content, and if your own content isn’t useful or interesting, people will simply unsubscribe and move on. Done right, a Facebook Interest List can be a way for you to demonstrate knowledge and build trust with your target audience, and in the process you can also build your own following with Facebook users.